Some residents of the Corcoran neighborhood have endorsed a plan that would bring several office and residential buildings to the mostly vacant lot adjacent to the Lake/Hiawatha light rail stop. The B-K-V group presented plans to Corcoran residents Thursday evening. The six-acre site is currently owned by Minneapolis Public Schools. The project would begin next fall with construction of a six-story office building, rental housing with 225 units, and a new farmers market promenade. Successive phases may include retail space, senior housing, and affordable housing. The development would be a dramatic change from the vacant area there now, said Jack Boarman, BKV group senior partner. The firm is seeking transit-oriented development grants, along with state and city funding for the project. "It's a vast open, really negative parking lot. But it's not five and six story buildings, it's not the definition of a whole new urban square. So it's going to be significantly different," Boarman said. 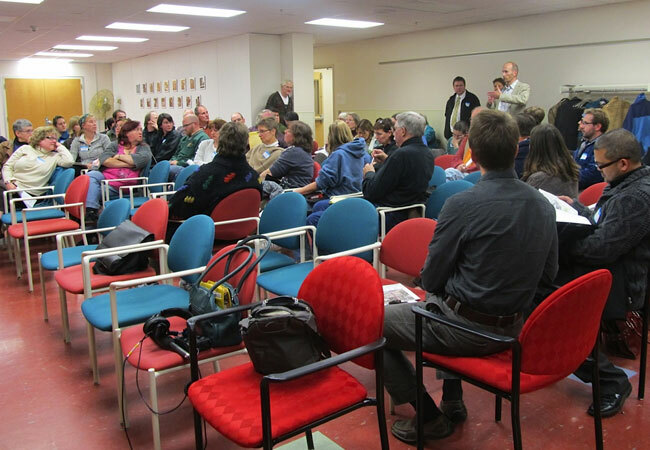 The development group showed about 75 residents gathered at a meeting some initial mock-ups. Phillip Koski of the Corcoran Neighborhood Organization said the developers benefit from the community's support of the project. However, residents were concerned about handicap accessibility, traffic congestion, and a lack of parking. "They don't necessarily need our approval. They are seeking our approval because it helps garner support — political support — for the entire process, for gathering funds," Koski said. "If they have the neighborhood group behind them, then they know the project's going to have an easier time getting those approvals."